As you might have read in our recent press release or seen on our Twitter this month, the payload study for Twinkle is now complete. This is a major milestone for us and our partners, and a big step towards our launch. We’ve written on the blog before about why we have a payload study, but what does its completion mean for the mission? Our Twinkle satellite has to be able to perform to a baseline standard for it to be useful for the type of science we want to carry out. To gather information about planets orbiting distant stars, the instruments in the satellite have to be able to detect features at certain wavelengths of light. They also have to be capable of picking out the light that has been affected by an exoplanet’s atmosphere, which can be just 0.01% of the overall light from the star. 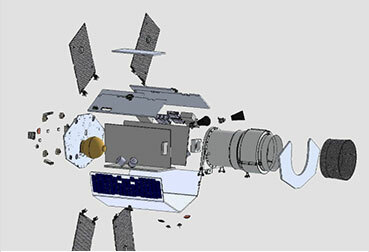 Twinkle’s telescope is based on technology developed for Earth observation missions by the Science and Technology Facilities Council (STFC) RAL Space. It will collect light with a primary mirror that’s about 50cm in diameter, and use a number of other small mirrors to ‘fold’ or redirect the light to into the sensors for analysis. Twinkle will find signatures of gases in exoplanet atmospheres (e.g. water vapour, carbon dioxide or methane) by analysing light at infrared wavelengths, using an instrument designed by STFC’s UK Astronomy Technology Centre (UKATC). Twinkle will also have a visible-light spectrometer, built by the Open University, that will look for signs of cloud cover and clues about weather and climate, as well as more general variations in the light from the host star. The design-work and the simulations that we’ve carried out in the payload study over the past year have confirmed that this setup will allow us to study our target exoplanets: bright super-earths and hot Jupiters orbiting close to their stars. But demonstrating how Twinkle will tackle its science goals is only part of the payload study story; we’ve also had to show that the payload will be able to survive the challenges of simply being in space. Heating and cooling can be huge problems. If our satellite gets too warm, it might end up detecting its own heat radiation, rather than the light from far off stars. There will also be a huge temperature difference between the side of the satellite facing the sun and the side facing away, which could cause parts of the satellite to expand or contract. This could be a real problem as Twinkle’s precise optics have to be kept steady for observations to be made. To deal these issues we turned again to the STFC RAL Space facility, which has been building coolers for successful satellite missions for the last 30 years. They will provide Twinkle with a compact, low-cost cooling system that has been specially designed for small satellites. We are very excited to have passed this milestone and move onto the next phase of developing the mission: a study of how our payload will be integrated into the spacecraft structure designed by Surrey Satellite Technology Ltd (SSTL).